For the past decade, the technology giants—Facebook, Google, Apple, Amazon, Microsoft, Tesla, Uber—have dominated the business world. Just last year, their stock prices appeared to be on an endless upward trajectory. The past year presented the major technology companies with multiple difficulties, and 2019 promises to be even more challenging. Expect extensive news coverage of how Russian agents used Facebook advertising to influence the U.S. election as special counsel Robert Mueller’s investigation continues. The Federal Trade Commission may take antitrust action as Google, Facebook, and Amazon dominate digital advertising revenue. Facebook faces a series of scandals: Russian agents using Facebook advertising to influence elections, its controversial data partnerships, and its privacy policies. Last spring, the Guardian broke stories on Cambridge Analytica’s use of Facebook sites to gain access to user data, including Facebook friends connected to these sites, to influence the 2016 U.S. election, triggering extreme political and media reactions. Mark Zuckerberg’s response? 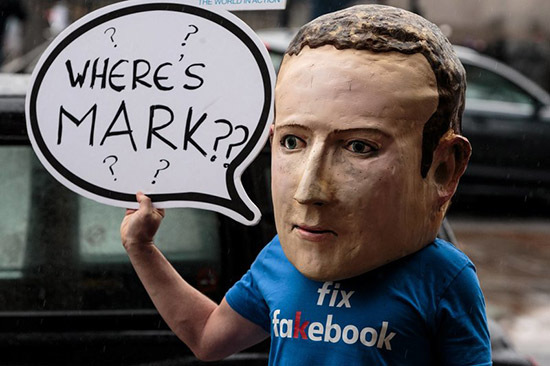 He went into hiding for five days, even sending his associate general counsel to replace him at Facebook’s regular employee town hall. When he did appear in public, he tried to blame everything on Cambridge Analytica. Six months later, Zuckerberg still hasn’t addressed the real issues and continues to react defensively as new issues arise. His distortions and deflections incited Facebook’s critics and invited the media to dig deeper. In response, Facebook hired attack dog PR firms to go after its detractors. Facebook’s problems are much deeper than Cambridge Analytica. It has amassed 2.1 billion users with the offer of a free site. But users are largely unaware that Facebook takes their private information to create highly detailed user profiles to sell to advertisers. The privacy issue can be easily overcome by requiring users to opt in or opt out of permitting Facebook to profile their information, and charging monthly fees for opting out. Facebook’s failure to address this issue suggests Zuckerberg is driven more by revenue and profit growth than by protecting users’ privacy. In May 2018, the European Union launched the General Data Protection Regulation (GDPR), the bulk of which may find its way into U.S. law. When GDPR required users to explicitly opt in or out, Facebook saw declines in its user base. Antitrust authorities are ramping up investigations of the tech giants for market dominance. Last summer, the European Union fined Google $5.1 billion in an antitrust action for misusing its Android operating system. In November 2018, President Trump said his administration is “very seriously” considering antitrust action against Amazon, Google, and Facebook. Even Amazon CEO Jeff Bezos acknowledged his company’s vulnerabilities, as his staff say government regulation is a major concern for the company’s outlook. Employees at the big tech companies are exerting strong influences of their own, forcing leaders to adjust to the new environment. In 2017, Google engineer James Damore attacked the company’s affirmative action program and was dismissed by Google CEO Sundar Pichai. In November 2018, more than 20,000 Google employees staged a walkout to protest the company’s handling of sexual harassment cases. Facebook has faced a series of high-level executive defections, with at least 10 senior executives announcing their departures, including Instagram co-founders Kevin Systrom and Mike Krieger. Following Uber founder Travis Kalanick’s forced departure, his successor Dara Khosrowshahi revamped his executive team and company culture to address outrage at sexual harassment incidents and Uber’s sharp-elbowed culture. In the past year, media coverage has relentlessly detailed the ways that excessive phone usage negatively impacts users—perhaps even rewiring the brain. How will tech companies, which all work hard to keep users on site, respond? Apple, for instance, now sends users weekly updates of their device time. Most of these tech giants are still controlled by their founders and have founder-dominated boards. Creating two classes of stock has enabled their founders to retain control of the company and their boards. On the surface, their rationale—to focus on long-term growth and investment—appears sound, but the concentration of power can lead founders to feel invincible. Zuckerberg, Kalanick, and Tesla’s Elon Musk have needed wise counsel, and they haven’t always listened. Zuckerberg says his company is at “war.” Is he really, or is his wartime mindset responsible for alienating executives, employees, and users? Uber founder Kalanick controlled his company’s board, which struggled to tame his abrasive style. He remained impervious to public and internal criticism until shareholders finally forced him to resign as CEO. The talented Elon Musk was recently banned from chairing Tesla after the Securities and Exchange Commission pressed securities fraud charges against him. Meanwhile, Musk’s erratic style has caused scores of Tesla’s top executives to resign. The problem also resides with their boards, who serve more as advisers than as governors. Recently, a former Facebook director claimed that founder-led companies are different. “At an ordinary public company, the board is the boss,” he said, while noting that Facebook’s board members play more of an advisory role. Public companies—regardless of who founded them—require strong and effective governance. If the boards of Facebook, Uber, and Tesla had taken governance more seriously, they could have averted some serious problems before they turned into crises. In Uber’s case, Arianna Huffington stepped up to transform its board, negotiate Kalanick’s departure, and recruit his successor. The more mature tech giants like Google, Apple, and Microsoft decided years ago to build strong boards filled with CEOs and experienced executives, which has enabled them to avoid many of the problems experienced by others. Google founders Larry Page and Sergey Brin had the wisdom to recruit Eric Schmidt as CEO until he became board chair of parent company Alphabet in 2015. As the tech industry faces even greater scrutiny in 2019, hubris among technology executives may force the government to step in. One proposal would impose time limits on two-class ownership structures, while another would require independent board chairs of founder-led companies. While founders feel the need to control their companies, they increase their odds of success when they engage other stakeholders who bring different perspectives to help create more durable, long-term enterprises. Tech companies like Google, Microsoft, Amazon, Apple, and Facebook play an important role in building a dynamic, innovative economy. Let’s hope their CEOs and boards step up to establish strong governance, effective processes, and aligned executive teams. Bill George is a senior fellow at Harvard Business School, former chairman and CEO of Medtronic, and the author of Discover Your True North.